Enhance the performance of your Saab 900 with a Do88 Front Mount Intercooler Kit. BIG-170 is designed to work on 1981-1986 Saab 900 models. Turbo vehicles utilize an intercooler to keep the charge air temps down. This translates to better performance. If you are trying to get the most out of your vehicle, an upgraded intercooler is what you need. This intercooler is developed to give the best performance with minimal modification. 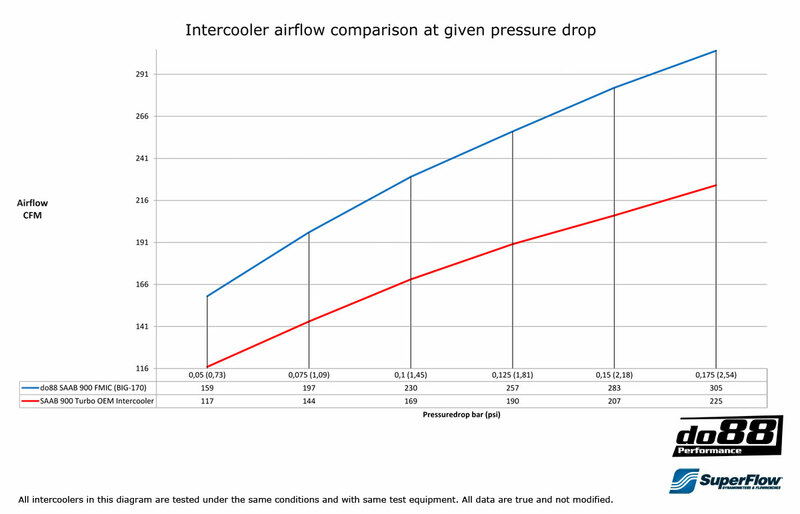 The Do88 Intercooler has cooling performance and low pressure drop versus the factory intercooler. The end-tanks on this intercooler are designed with CAD software with the aim to create the best possible end-tank that distributes the the airflow over the entire core to maximize cooling while minimizing pressure drop. The Front Mount Intercooler Kit contains all brackets and mounting hardware needed for an effortless install. Excellent cooling performance and low pressure drop! Fits without AC, model year -1986 with the old front. Compatible with AC, model year 1987- with new front. Compatible with the battery in the original position. New towing eye included (originals must be cut away).